Maududi was considered an imam, a scholar and philosopher. His many works were in Arabic and translated into English, Tamil, Burmese and many other languages. Although a Sunni, Iran's Ayatollah Ruhollah Khomeini is said to have met Maududi as early as 1963 and later to have translated his works into Persian. The rhetoric rising with Iran's 1979 revolution is said to have drawn on Maududi themes. Sayyid Qutb (1906-66). In his youth, Qutb was attracted to Western literature. He studied in the United States from 1948 to 1950. But he became disillusioned, disliking what he saw as excessive materialism, violence as in boxing, emphasis on sexual pleasure, various superficialities and support for Israel. Qutb returned to Egypt, and in 1953 he joined the Muslim Brotherhood and editor-in-chief of ta Brotherhood weekly and soon the Brotherhood's propaganda chief and a member of it Guidance Council. in 1954, Nasser's regime had him sentenced him to fifteen years in prison. There Qutb became more vehement and resentful. He hated Nasser and Nasser's secularism. Good Muslims, Qutb concluded, could not live in peace in a society like Nasser's Egypt. The Islamic world, he believed, was riddled with evil. Humanity, he said, was living in a large brothel. Like Maududi, he wanted to turn back the rising tide of secularism. All the major religions had changed over time. Hinduism by the twentieth century, with all its diversity, was hardly an exact copy of the Hinduism of the early arrivals into the Indus Valley. Judaism had divided into schools of thought. So too had Christianity and Islam, which was an offshoot of these faiths. And with time Islam had its changes and divisions. But Qutb wanted nothing to do with the changes that came with human experiences. He wanted a return to the Islam created by the Prophet Muhammad. Sayyid Qutb in Egypt. He was more puritanical than John Calvin and devoted to faultlessness and intolerance. He believed that most Muslims had abandoned Islam. Nasser thought him unfit to live. He was viewed by others as a most accomplished intellectual. Qutb wanted to purge Muslims modernizing influences such as those intellectuals centuries before, Ibn Sind, among them, who had taught "nothing but a shallow version of Greek philosophy." Qutb called for a new Koranic generation who would gather up a pure understanding of Islam's original sources, to replicate the companions of the Prophet and rebuild Islam out of the ruins of Western natonalism, to declare the "supremacy of divine law alone and the cancellation of human laws. (p 521). Before a Muslim steps into the battlefield, he has already fought a great battle within himself against Satan, against his own desires and ambitions, his personal interests and inclinations, the interests of his own family and of his nation; against anything which is not from Islam; against every obstacle which comes into the way of worshipping Allah and the implementation of the Divine authority on earth, returning this authority to Allah and taking it away from the rebellious usurpers. History has recorded the wicked opposition of the Jews to Islam right from its first day in Medina. Their scheming against Islam has continued since then to the present moment, and they continue to be its leaders, nursing their wicked grudges and always resorting to treacherous schemes to undermine Islam. Nasser's regime did not take to the idea of having their man-made laws abandoned and replaced. Qutb had become too much of a threat, and early on August 29, 1966, the regime hanged him. He went to his hanging with the words, "Thank God, I have performed jihad for fifteen years until I earned this martydom." (Pagden, p 521.) According to his admirers Qutb died smiling, "showing his conviction of the beautiful life to come in paradise." 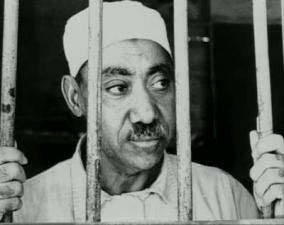 Sayyid Qutb's younger brother Muhammad Qutb was released from an Egyptian prison in 1972 and moved to Saudi Arabia. There he promoted his brother's ideas. He too wrote books, and he taught. One of Muhammad Qutb's students and followers was the Egyptian Ayman Zawahiri, who became the mentor of Osama bin Laden of al-Qaeda fame. Pakistan's Abul A'la Maududi lived to September 1979and died in a hospital in Buffalo, New York, where his second son worked as a physician. Maududi was buried in an unmarked grave at his residence in Lahore, Pakistan, following a large funeral procession through the city.